Get it right now for only 29 EUR! Pop3Connector is free for up to two POP3 accounts! Click on the images to scan through different views of the monitoring application. Pop3Connector needs the .NET framework 4.5 (or higher) to run. 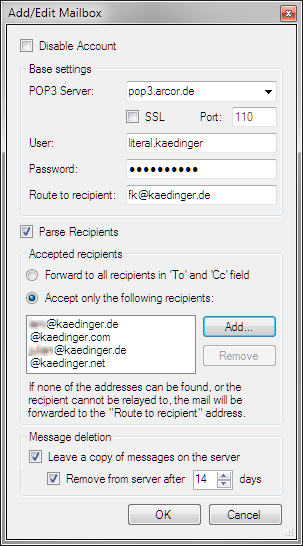 By purchasing a Pop3Connector license and registering it with the software, unlimited mailboxes and mail addresses become immediateley available. The price for a full version license is currently starting at 29 EUR incl. VAT. 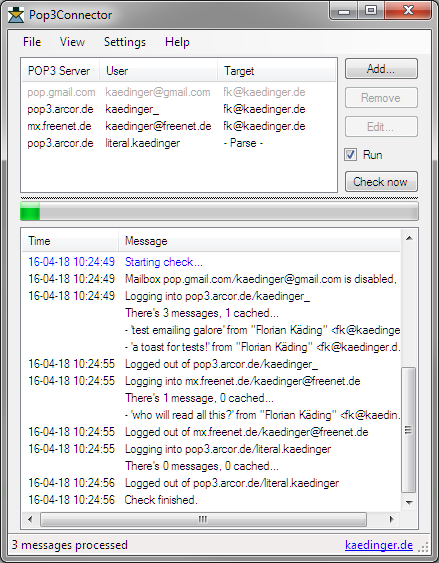 The full version license also includes lifetime free updates - Pop3Connector is actively developed at the moment. Features to come include advanced scheduling, usage of Exchange's pickup directory, and advanced archiving features. Customers in Germany: Purchase full license at our shop (recommended). Customers anywhere else: Purchase full license at MyCommerce/Digital River. Note that for registering the license, an internet connection is necessary to our license server. 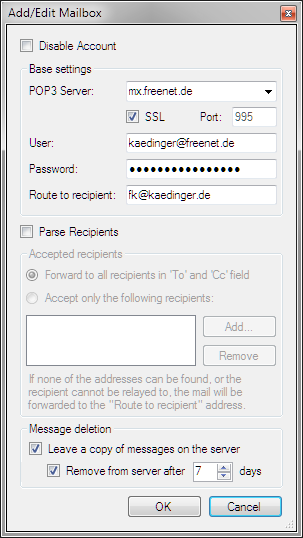 Licenses can easily be moved to new machines by de-registering and re-registering within the Pop3Connector software. Please take a look first at the ReadMe file. If you need to contact our support, please do so via email. If you do not have access to your mail account, you can use this form. Please provide your full name and email address. Your data will be sent as an email to our support team to answer your inquiry. There will be no other storage or usage. Can I port the license from one computer to another? Yes. 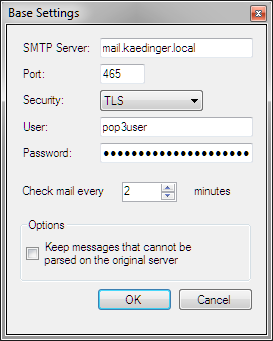 Using the license dialog in the Pop3Connector GUI you can deregister the license on the 'old' machine and then register it on your new server. If the computer holding the license is not available anymore, please contact us including the receipt number and/or the email address the license is registered to. I see there is a new version available. How do I upgrade? If you installed the Pop3Connector using the msi installer, just install the new version with the msi installer, too. If you used the manual install explained in the ReadMe.txt: remove the service as explained in the ReadMe, and the install the msi package or install manually again. 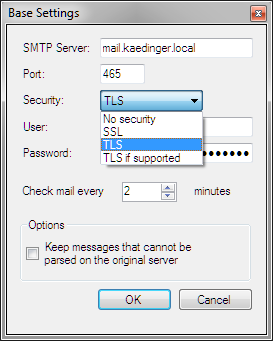 All your configuration settings and mailboxes are retained. ProgramsHome.com A directory of free and shareware software,instant messaging software,computer software,dvd software,cheap software,chat software,webcam software Ultimate collection of games and multimedia software!My Media Player provides detailed information for games and multimedia related software applications covering major operating systems. Users reviews and free, instant software download. IT Shareware - A shareware and freeware collection with reviews and free downloads. Categories include games, Internet & network utilities, screensavers, audio & video, graphics, and business applications. Shareware Plaza! Software Downloads at URLFile Pop3Connector for download on File Fishstick Catalog of software: a lot of newest software for you to download.